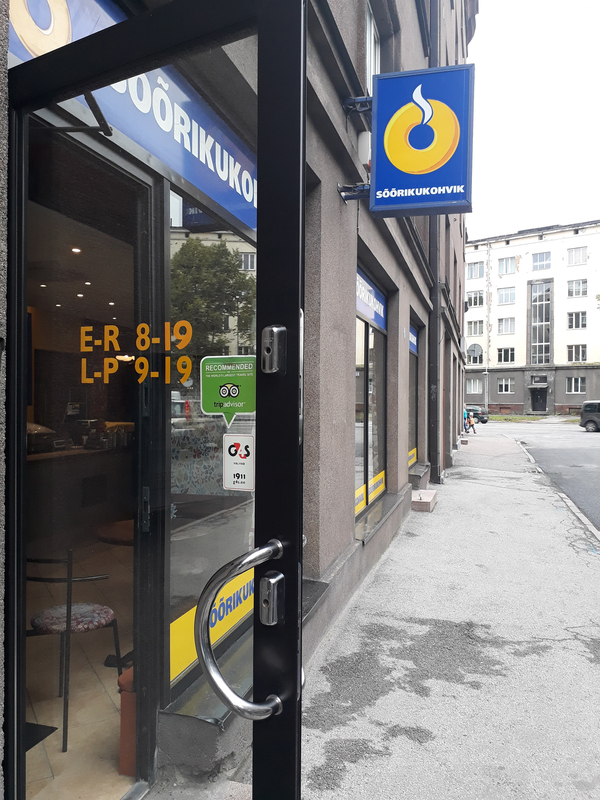 Review: Sõõrikukohvik is located walking distance (a little only 1 kilometer) from downtown or you can grab the number 3 bus to the Keskhaigla stop and walk around the corner. Either way it’s just off the beaten path enough that most people probably wouldn’t stumble on it but not so far out of the way that it’s a bother to get to. The cafe itself definitely harkens back to cafeterias, which were a staple in Soviet times but for me, it felt distinctly like school. The inside is actually very warm and inviting with large wooden tables and all four walls covered in bright, diverse wallpapers. They give the space a softness that isn’t always found in the buildings around that area. There seemed to be ample seating but people who came in were a mix of sit down eaters and to go. Many items are available to grab and go but there is a small menu as well of homey food including pancakes and pastas and naturally, there are also doughnuts. Oh yes, doughnuts. They come in glazed, chocolate, or plain topped with powdered sugar. Everything on the menu is very cheap to the point where I’m unsure how they make any money at all (though the man in front of us bought 2 kilos of doughnuts so maybe they make up for it in volume). 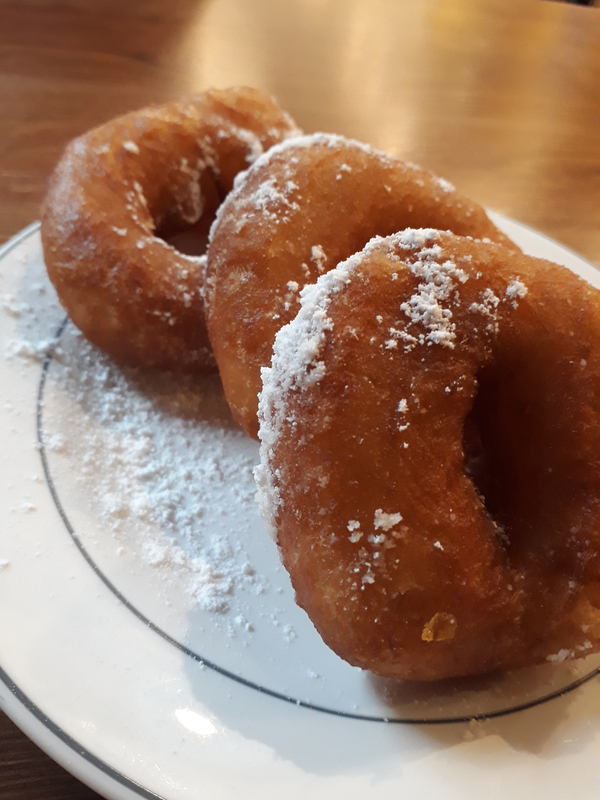 The doughnuts come out in small batches so they are always fresh and hot and since they’re made to order there is a pleasant smell of grease, yeast, and sugar filling the entire space. I haven’t had a doughnut in a while but these were really good. They’re more dough-y than American style doughnuts (which tend to land somewhere on the cake-y spectrum). These came piping hot so we had to actually wait a minute to eat them! They absolutely filled both of us with an almost maniacal glee when we ate them. They cause your hand to become sticky and your mouth to hurt from smiling and they’d be perfect on a cold, dark day when you need something simple and carb filled to make you feel warm and alive. 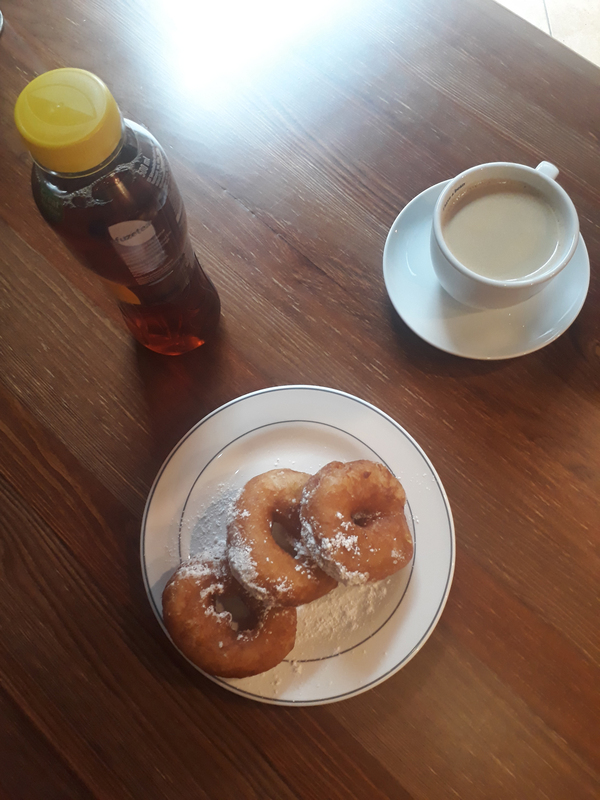 The coffee is simply from a machine (the type where you place the cup under a spout and hit the button for yourself) so its nothing to write home about but I think between two drinks and three doughnuts it was about 4 euros so there’s nothing to complain about. The cashier was also very sweet to us even though we were quite oddly excited to eat doughnuts.